The Waldorf Astoria has been a symbol of luxury for decades. The Waldorf Astoria in New York is being sold to a Chinese insurance company for $1.95 billion. Conrad N. Hilton acquired the iconic luxury hotel 65 years ago and on Monday Hilton Worldwide (HLT) announced its sale to Anbang Insurance Group. Hilton will continue to operate the Waldorf for the next 100 years under a "strategic partnership" with the Beijing-based company. 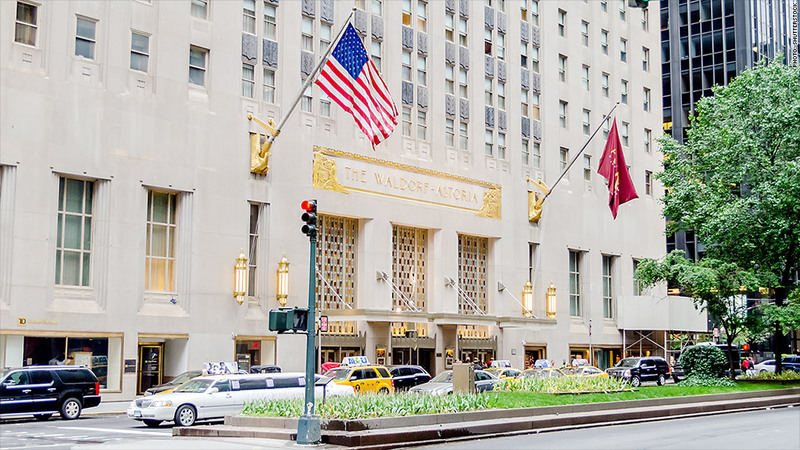 The Waldorf Astoria will undergo a "major renovation" to restore the hotel to its "historic grandeur," according to a joint statement from Hilton and Anbang. The Waldorf Astoria is the flagship of Hilton's 27 luxury hotels around the world. It first opened in 1893 on the site of millionaire William Waldorf Astor's Fifth Avenue mansion. Waldorf's cousin and fellow millionaire John Jacob Astor IV reconstructed the hotel a few years later at a nearby location. The hotel fell into disrepair during prohibition and was torn down in 1929, making way for another landmark: the Empire State Building. The Waldorf is a cultural icon and has hosted foreign heads of state for years. It was featured in a 1945 film staring Ginger Rogers called "Week-end at the Waldorf." Legend has it that the Waldorf salad was invented by the maître d'hôtel of the Waldorf Astoria in 1896. The hotel is home to restaurants where New York's elite dine such as Peacock Alley, Bull and Bear Prime Steakhouse and Oscar's. The Waldorf Astoria has been at its current location on Park Avenue since 1931. Hilton plans to open nine more swanky hotels globally in locations that range from Bali and Bangkok to Beverly Hills. The company said it will use the proceeds from the Waldorf sale to fund future purchases.